Defect Structure and Properties of Nanomaterials: Second and Extended Edition covers a wide range of nanomaterials including metals, alloys, ceramics, diamond, carbon nanotubes, and their composites. This new edition is fully revised and updated, covering important advances that have taken place in recent years. Nanostructured materials exhibit unique mechanical and physical properties compared with their coarse-grained counterparts, therefore these materials are currently a major focus in materials science. The production methods of nanomaterials affect the lattice defect structure (vacancies, dislocations, disclinations, stacking faults, twins, and grain boundaries) that has a major influence on their mechanical and physical properties. 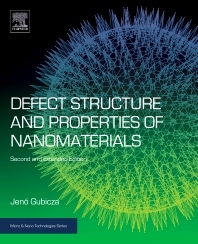 In this book, the production routes of nanomaterials are described in detail, and the relationships between the processing conditions and the resultant defect structure, as well as the defect-related properties (e.g. mechanical behavior, electrical resistance, diffusion, corrosion resistance, thermal stability, hydrogen storage capability, etc.) are reviewed. In particular, new processing methods of nanomaterials are described in the chapter dealing with the manufacturing procedures of nanostructured materials. New chapters on (i) the experimental methods for the study of lattice defects, (ii) the defect structure in nanodisperse particles, and (iii) the influence of lattice defects on electrical, corrosion, and diffusion properties are included, to further enhance what has become a leading reference for engineering, physics, and materials science audiences. Jenő Gubicza is a Professor at Eotvos Lorand University in Budapest, Hungary. He received his PhD and Dr.habil degrees in 1997 and 2005, respectively. Prof. Gubicza’s main research field is the study of microstructure of nanomaterials. He has published two books entitled „Defect structure in nanomaterials” and „X-ray line profile analysis in materials science” in 2012 and 2014, respectively. Prof. Gubicza was awarded the scientific title of Doctor of the Hungarian Academy of Sciences, the Schmid Rezso Prize of Roland Eotvos Physical Society and the Bolyai-plaquette of Hungarian Academy of Sciences. He has published more than 200 papers that have been cited more than 2700 times.